This month we’re bringing you updates that improve the ease of navigation of the landing page, add to dashboard tile features, and increase functionality in Azure Container Instances. Sign in to the Azure portal now and see for yourself everything that’s new. Download the Azure mobile app. 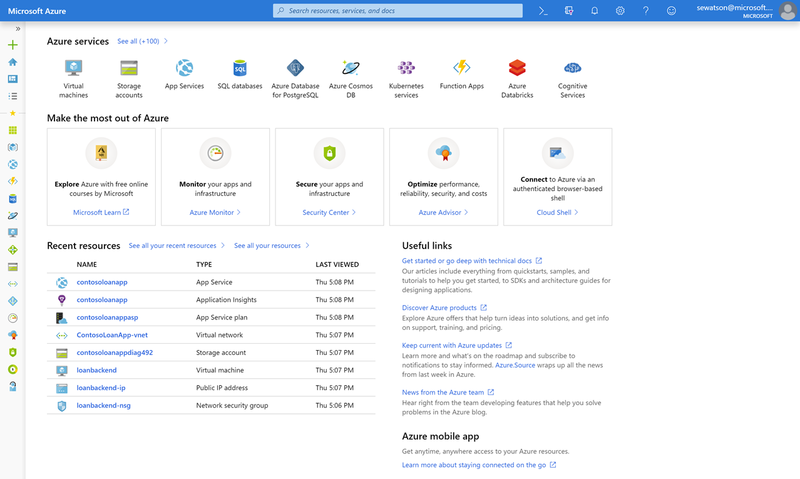 The new Azure portal home page is a quick and easy entry point into Azure. From there, you can find recently visited resources, navigate to commonly used services, and discover how to use specialized services to learn, monitor, secure, and optimize your applications and infrastructure. Improve discoverability of our services. We start by highlighting some of the most popular services in the “Azure services” section at the top, but we also provide access to the entire list. Help you to make better use of Azure. All the services in the “Make the most out of Azure” section are either free or have free offerings so you can start using them right away! Provide quick access to recently used resources. We display up to 12 resources, but if you have more, we provide access to the full list of recently used resources. Offer immediate access to important resources. The useful links section points to resources to learn about the platform, such as technical docs and product information and to stay informed about what is going on like Azure updates and news. Provide easy access to the Azure mobile app. Download the Azure mobile app so you can stay connected, informed, and in control when you are on the go. Select Settings in the upper right corner. Under “Choose your default view,” select Dashboard. Previously, the time range would need to be set individually for each tile on Azure dashboards, but you can now globally specify the time range for supported tiles. Not all tiles support the globally shared time range, but those that do will show a filter icon in the top left and will light up when the shared time range dialog is open as shown in the screenshot below. 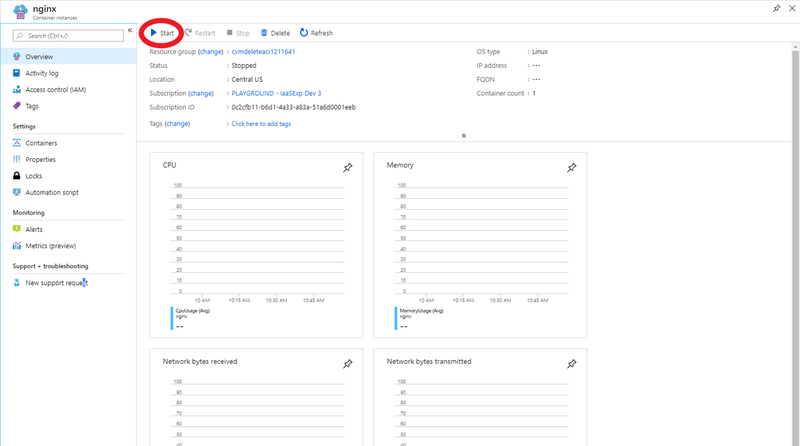 Tiles for Log Analytics queries and Azure Monitor metrics do support shared time range, but if you have a metric chart that was pinned a long time ago, it might not support the shared time range. In that case, you will have to go to Azure Monitor and re-pin that chart. Select Monitor from the left navigation pane or from the All services menu. From Monitor, select the Metrics menu item. From Metrics, configure a metric and then select Pin to dashboard. Go back to the dashboard. You should see your tile with the filter icon in the top left. You should also see a time filter widget appear under the dashboard name. Select the time filter widget to expose the time range dialog. You should see your new tile light up. Tiles that don't support the shared time range will be dimmed. Modify the time range and select the Apply button. All tiles that support shared time range should reload their data scoped to the desired range. ACI allows you to quickly and easily run containers on Azure without managing servers or having to learn new tools. It is now possible to easily start and restart your containers in ACI via the portal. If you have any stopped containers, a new "Start" command will be available on the ACI overview page that will let you start all of your containers quickly and easily. With the Azure portal, you can test features in preview by visiting preview.portal.azure.com. We will soon be introducing Azure portal “how to” videos on YouTube on the Azure channel where you can learn about specific features in order to become more productive using the portal. Stay tuned for more details! Don’t forget to sign in to the Azure portal and download the Azure mobile app today to see everything that’s new, and let us know your feedback in the comments section or on Twitter. See you next month!